Tomorrow is the first day of the plastic diet. I've been wanting to participate in a zero waste challenge since it caught my attention. I discovered that during the month of September, there is a 30 day challenge called 'the plastic diet'. I'm not sure about the rules of this challenge so I came up with a couple of rules of my own. - Avoid plastic packaging as much as possible. - Use my keepcup if I want to take coffee or tea on the go. - Write a post every couple of days showing my grocery hauls and write about other zero-waste related topics. My first 'low-waste' haul. 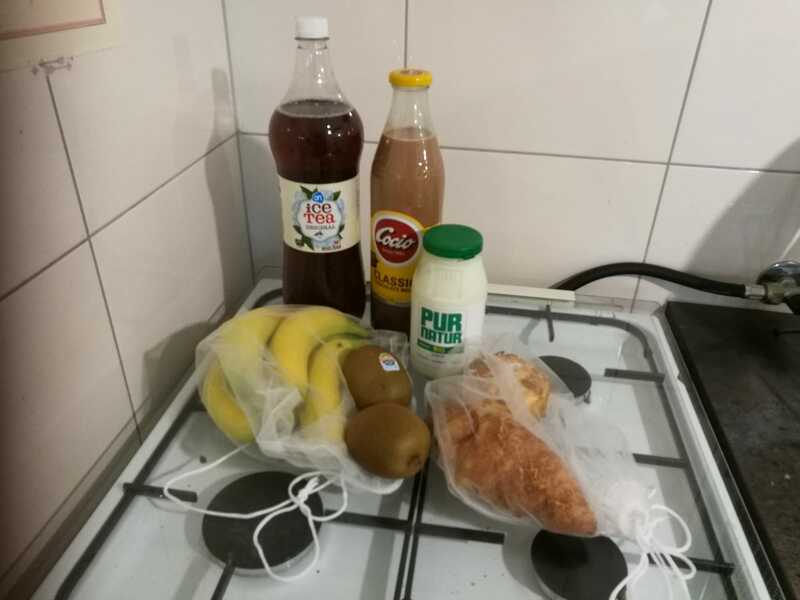 Bags for the fruit and bread, glass bottles for the yoghurt (unfortunately with a plastic lid) and chocolate milk. I returned the ice-tea bottle to the store and got my 25 cents back. I really look forward to the next 30 days and I'm curious to see how much plastic I can avoid. I'll try to answer your mail as soon as possible (I check my e-mail everyday). Recipe : Oreo Milkshake !